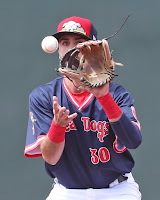 On Thursday's minor league opening day, SoxProspects.com released its Pre-Season All-Stars. Michael Chavis, Bobby Dalbec, and Triston Casas headline the hitters. Check out the rest of the all-star lineup here. Part 2 included four starting pitchers and three relievers, with Darwinzon Hernandez leading the starters and Durbin Feltman headlining the relievers. Check out the rest of the staff here. The minor league season is underway, which means another year of the Cup of Coffee at SoxProspects.com. In each Cup, the writing staff will briefly recap each Sox minor league game along with announcing a player of the night. Check out the most recent edition from James Dunne, highlighting Hernandez' strong start to 2019. Some notable hitters who are off to fast starts this year include C.J. Chatham (pictured), Bobby Dalbec in Portland and Jarren Duran in Salem. Chatham is 5 for 15 with three doubles, Dalbec is hitting .286/.412/.500 in 17 plate appearances, and Duran is 6 for 15 with a triple and a stolen base. On the mound, Darwinzon Hernandez and Kyle Hart have been strikeout machines early on, combining for 21 punchouts in 11 innings. Alex Scherff looked terrific in his first outing, as did Bryan Mata. It is worth noting that Mata is still the youngest player in the Carolina League. Baseball America released its list of the 10 youngest players in each league as of Opening Day throughout professional baseball. At the big league level, Rafael Devers is still the fourth youngest player in the American League. Chad Jennings of The Athletic (subscription required) had a conversation with Red Sox Vice President of Player Development Ben Crockett about the state of the system. He talks about a few aggressive assignments to start this year as well as thoughts on some of the organizations top prospects. With Xander Bogaerts signing a seven-year extension with Boston, it doesn't look like C.J. Chatham will be anchoring the shortstop position at the big league level for the Red Sox any time soon. Kevin Thomas of The Portland Press Herald talked to Chatham to get his reaction to the Bogaerts extension. Matt Vautour of MassLive.com writes about a few minor league promotions in New England for April.